3 bedrooms, 2 bathrooms, sleeps 5 comfortably. Property Size 1,255 sq. ft.
A fully air conditioned 3 bedroom condo, with 2 bathrooms, this ground floor unit is extremely well furnished with your comfort in mind. It does only sleep 5 people and we do restrict occupancy to that number to protect the integrity of the home. The bedrooms consist of a Master with a King size bed and full en-suite facilities, another Queen size bedroom and a very practical room, with 1 twin bed and an office desk and chair. These 2 rooms share a full bathroom. Each bedroom has a wall mounted flat screen television. Other features of Heavenly Bliss include a fully stocked kitchen, comfortable living room, and separate dining area. There is also a laundry room with a full size washer and dryer. Another major plus for a condo is that this home also has a single car garage!. The main living area boasts a 50 inch plasma television, with a DVD player too!. The room has a large sofa and chair, and is decorated with pastel shades, with tranquil colors that offer a stylish and relaxing appearance. Incidentally, note too that this home enjoys high-speed WIRELESS internet access, which is complimentary to guests, and that all calls to the US and Canada are also free of charge. The kitchen is fully equipped too with a dishwasher, microwave, full refrigerator, stove, coffee machine, toaster, blender and waste disposal. All towels and linens are supplied for your stay in all our homes, with kitchen utensils and crockery provided too. Sliding patio doors from the living area lead onto a screened in patio, from which you can enjoy a conservation view of the Oakwater courtyards, which are directly opposite the home. The main clubhouse and pool are just a short relaxing walk away. Heavenly Bliss is already a well established vacation home, and is destined to be a popular choice with our clients for some time to come. It compares very favorably with all the beautiful homes we are proud to have in our portfolio, and offers a real touch of class that can be felt the minute you walk through the door. Given the upgraded furnishings, great location, excellent view, and all the facilities that Oakwater provides, this home represents tremendous value for money and comes highly recommended. With tennis courts already in place, a basketball court and a sand volleyball court too, Oakwater Resort does have it all, yet it remains surprisingly quiet. The resort is full of some of the nicest vacation condos and town-homes you could ever wish to see, and Heavenly Bliss is certainly one of them. 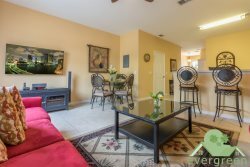 If you want to be right in the middle of all the action, and truly enjoy all that the Disney area has to offer, then Oakwater Resort would be an excellent choice, and Heavenly Bliss a great place to stay!.